← Election Prayer – VOTE!! I wish to create safer space. 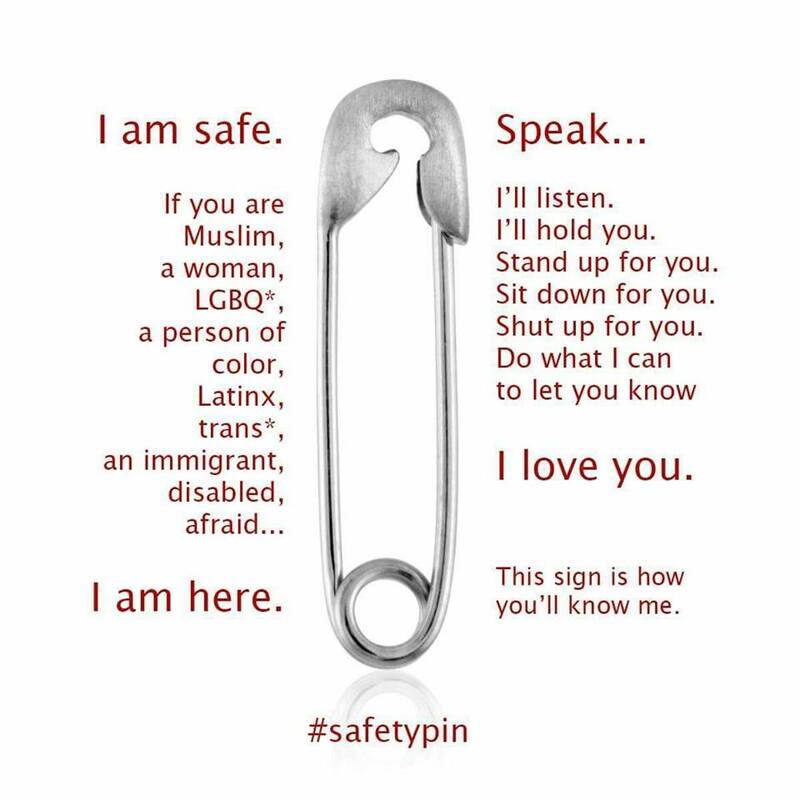 If you too wish to create safer space, wear a simple, unadorned #SafetyPin on your person. Mine is pinned to my purse so that it is always with me wherever I go. This entry was posted in Community, Interfaith, Ministry, Personal, Politics, Praxis, ST4R and tagged #SafetyPin, Community, Emotion, Ethics, Look What I Found!, politics, privilege, Religion and Spirituality, Safe Space, Safer Space, Self Work, Vanic Values. Bookmark the permalink. I can’t offer those things everyday so I guess I’ll try to remember to put on or take off the pin the day of? I doubt everyone who is wearing them as a new habit can offer that all the time, but most of us are unlikely to be asked *all the time*, so much as on an urgent basis. If you’re having a day where you feel like, even on an emergency interrupt basis, you couldn’t pull it together enough for that, then yeah, take the pin off for a day, no harm, no foul, I’m sure. The point is not to support each other *instead* of ourselves, the point is to share the load.